Hardwood floors have long been a mainstay of many Indiana homes. It's no wonder - hardwood brings a timeless beauty to any room. Maintenance is simple. And today's wood floor options make it an affordable choice. When you're considering hardwood floors, you'll likely have some questions about how it fits in your lifestyle and home. The experts at Kermans have the answers. My son suffers from allergies. Is hardwood a good choice for our family? Yes! According to the National Wood Flooring Association, tests by leading allergists have proven that wood flooring provides a healthier environment for these allergy sufferers. Wood doesn't harbor irritating dust and microorganisms. And bacteria, dust and dirt cannot become embedded in a wood floor like they sometimes can in carpeting. Is hardwood a good environmental choice? The trees use for hardwood are a sustainable resource and today's choices bring even more environmentally friendly options. Bamboo floors are gaining in popularity and the bamboo plant grows very quickly. Engineered wood floors are another popular option that use slightly less wood than a solid hardwood floor. How will wood flooring look in my existing home? Hardwood floors come in so many varieties and shades that they are a beautiful, natural touch in any home decor. Kermans also has trained design experts that can help you select the style and color that looks best. Isn't hardwood difficult to maintain? The finishes used on today's hardwood floors are more water and scratch resistant than ever before. Regular sweeping and dust mopping will keep your floor looking like new. Review more hardwood cleaning tips. Why should I buy my hardwood from Kermans? This month's Kermans Advantage is 5” Engineered Hand Scrapped Birch or Hickory hardwood for $5.98 installed as nailed, stapled or floated. Available thru July 31. We welcome your questions and look forward to helping you find just the right flooring - whether it's hardwood, carpeting, tile, area rugs or some combination of them all. 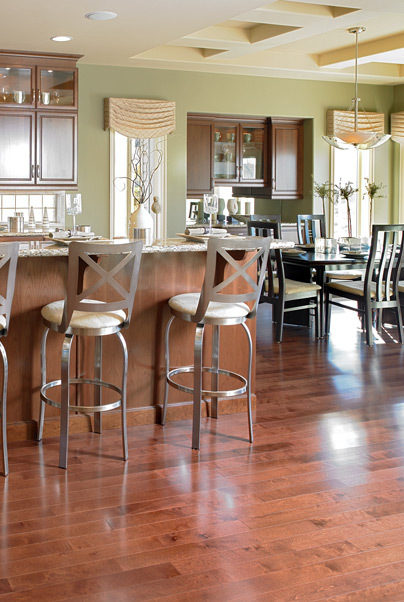 Check out our Hardwood Buyer's Guide to learn more about our hardwood floor options. Then visit our Indianapolis showroom to experience the Kermans Advantage for yourself.